Awesome game. Sixty five wrestlers from many different promotions - All Japan, New Japan, FMW, Michinoku Pro, WWF and WCW. What's even better is the large amount of moves each character has. All the moves are actually real moves that the wrestlers do. Take a look Misawa's rolling elbow and his tigerbomb. This is a Super Fire game, so there's a lot of options and quite a few different types of matches. The graphics aren't the best, but the game is fun and defenetly worth playing. 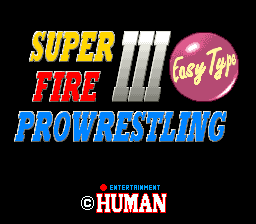 In case you're wondering what's the difference between this game and Super Fire Pro wrestling 3 - Final Bout, Easy Type is much easier and all the secret wrestlers are unlocked. Bottom line: The graphics aren't great, but it's fun and has many wrestlers and moves. The small size makes it a worthwhile download.